Philip Schaff, the founder of church history in America, was widely celebrated in his later career. Soon after his arrival from Germany, however, his Principle of Protestantism (1845) was stiffly denounced for its favorable attitude toward Roman Catholicism, harsh critique of denominationalism, and theory of historical progress leading to a church that would be both Evangelical and Catholic. Charles Hodge's review of the book provided the most cogent analysis of its implications for American Christianity. Schaff further clarified his understanding of progress in What Is Church History? (1846) and "German Theology and the Church Question" (1853). Together, these early writings of the Mercersburg theology set forth the parameters of what later generations would call the ecumenical movement. This edition carefully preserves these texts while providing extensive introductions, annotations, bibliography, and a glossary of key names to orient the reader and facilitate further scholarship. The Mercersburg Theology Study Series presents attractive, readable, scholarly, modern editions of the key writings of the nineteenth-century theological movement led by Philip Schaff and John Nevin. It aims to introduce the academic community and the broader public more fully to Mercersburg's unique blend of American and European, Reformed and Catholic theology. 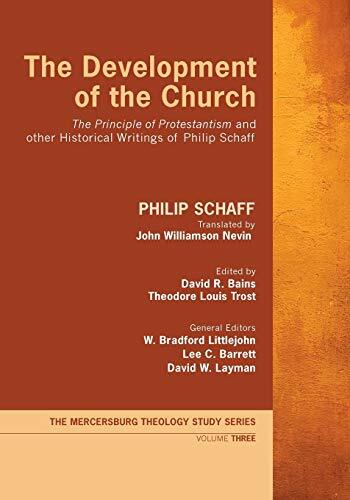 Philip Schaff (1819-93) was a professor at Mercersburg Seminary and Union Theological Seminary, and nineteenth-century America's leading church historian. David R. Bains is the Armstrong Professor of Religion at Samford University. Publications of his histories of theology and worship include The Wiley-Blackwell Companion to World Christianity. Theodore Louis Trost is Professor of Religious Studies and New College at the University of Alabama. His writings include Douglas Horton and the Ecumenical Impulse in American Religion.